Should Investors Care About Marvell's $1 Billion Stock Buyback Program? Let's look at how it fits into the bigger picture. On Oct. 16, chipmaker Marvell (NASDAQ:MRVL) said in a press release that its "Board of Directors has authorized a $700 million addition to the balance of its share repurchase program, increasing the total current repurchase authority to $1 billion." The company says that it "may repurchase shares in the open-market or through privately negotiated transactions." Let's explore if investors in the company should be excited by this addition to the company's buyback authorization. One thing I like to do when a company announces a share repurchase program is to look at the size of that program relative to the company's market capitalization. If the buyback represents a significant portion of the company's market capitalization, then it has the potential to take its share count down in a meaningful way, potentially leading to a boost in the company's earnings per share that'll actually matter to investors. As of this writing, Marvell's market capitalization was around $10.89 billion, meaning that the repurchase authorization is good for around 9.2% of the company's shares outstanding. Now, in the real world, that share repurchase isn't going to happen all at once -- in fact, the company said in its press release announcing the increase in the repurchase authorization that "[the] extent to which Marvell repurchases its shares and the timing of such repurchases will depend upon market conditions and other corporate considerations, as determined by Marvell's management team" -- but if Marvell executes on this repurchase program in a timely fashion, then I'd call it significant. Another thing that I like to look at when a company adds to a repurchase program or implements a new one is how effective the company's previous programs have been in reducing the company's overall share count. MRVL Stock Buybacks (TTM) data by YCharts. As you can see in the chart above, Marvell has spent quite a lot on buybacks over the years and its share count had been trending solidly downward as a result of those buybacks. 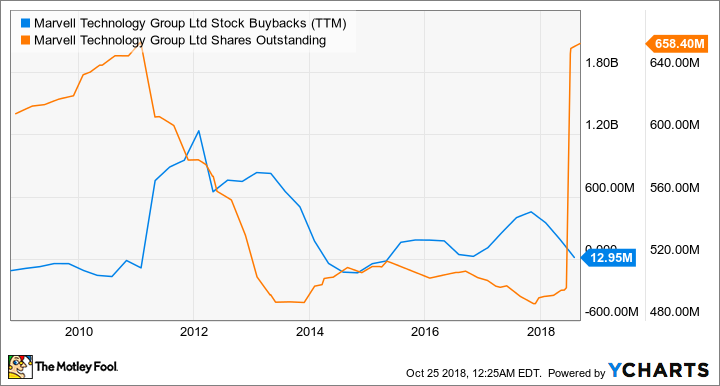 This tells me that Marvell's previous buyback programs have largely been successful at bringing down the company's share count. Now, you'll notice that the company's share count spiked significantly earlier this year. As you might recall, Marvell announced its intent to acquire network processor specialist Cavium late last year and the deal closed in July. Marvell paid for Cavium with a combination of cash ($40 per Cavium share) and stock (2.1757 Marvell shares per share of Cavium). The issuance of shares to pay for the deal led to the significant rise in Marvell's share count that we see above. Given Marvell's previous history, I think the odds are good that the company's latest share repurchase authorization (as well as any that the company's board of directors puts into place in the future) will have the effect of bringing the company's share count down meaningfully. In an ideal world, Marvell's acquisition of Cavium plays out nicely over the long term, boosting Marvell's free cash flow generation and, ultimately, its ability to repurchase shares over time.